Flint. (Mid. Dutch. = vlint; Old High Germ. = flins). 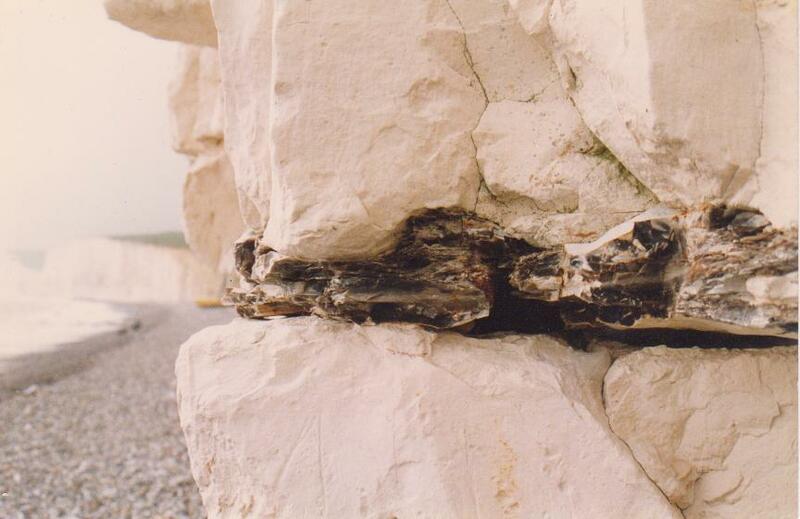 Flint nodule layer in the chalk cliffs, Seven Sisters (photo by Peter Knight). Flint is a hard rock composed of cryptocrystalline silica (SiO2) so called because the crystals are too small to be distinguished under the microscope (Allaby & Allaby, 1999, p. 137). However, in some cases a very finely crystalline mosaic can be seen - said to be microcrystalline. It commonly occurs as irregularly shaped nodules varying from sub-spherical to oval and elongate with an undulating outline and smooth, sometimes pitted surfaces. The nodules generally have a white rind surrounding a black, brown or light grey core. They occur along bedding panes and at joint-bedding plane intersections in chalk and limestones. 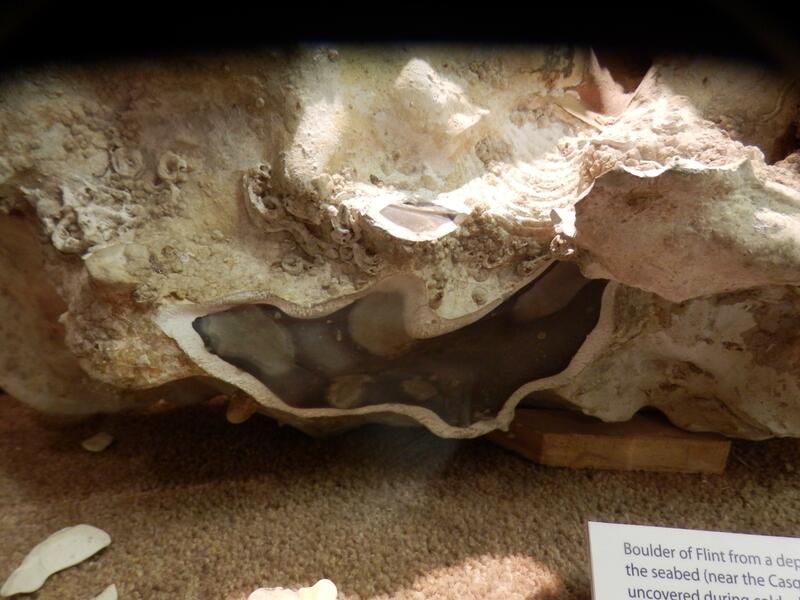 In Jersey, they occur as pebbles in the present day beach deposits and in the 8m and 18m raised beach deposits, eg. at Snow Hill (St. Helier), Le Mont du Jubilé (Jubilee Hill, St. Peter), and along the north coast (Bishop & Bisson, 1989, p. 82-86). These authors quote the earlier work of Renouf (1969), Renouf & Bishop (1971), Keen (1975, 1978b) and Dunlop (1911) who describe the flint associations with pebbles of local rocks. There are five outcrops of the Chalk near to Jersey, three are shown below, one large one to the NW of Guernsey, two smaller ones; to the north of Guernsey and south east of Sark. The closest ones occur north of Jersey around Sark and Guernsey (green brick symbol on BGS. Guernsey Sheet, 49N 04W, 1:250 000, 1989). Nodules and pebbles of different sizes, colour and internal structure and texture occur on many island beaches (photographs below). 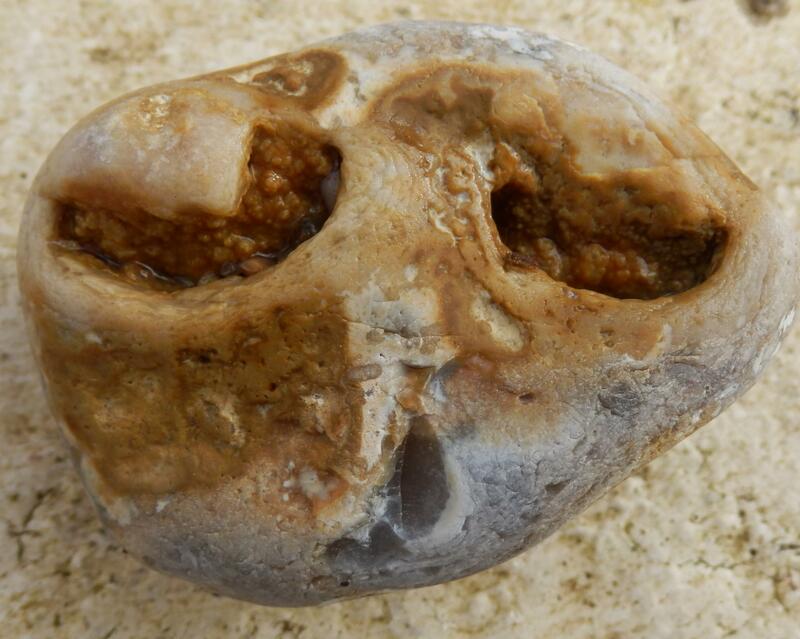 The pebbles of the former nodules now vary in size from 2-10 cm and sometimes contain fossils and moulds of fossils such as small bivalve molluscs. They are considered to have been derived from the chalk deposits, possibly similar in part to those above, on the sea bed to the north and west of the island, having been eroded and then rolled up during the rising sea levels which produced the various raised beaches, including the beaches of the present day. 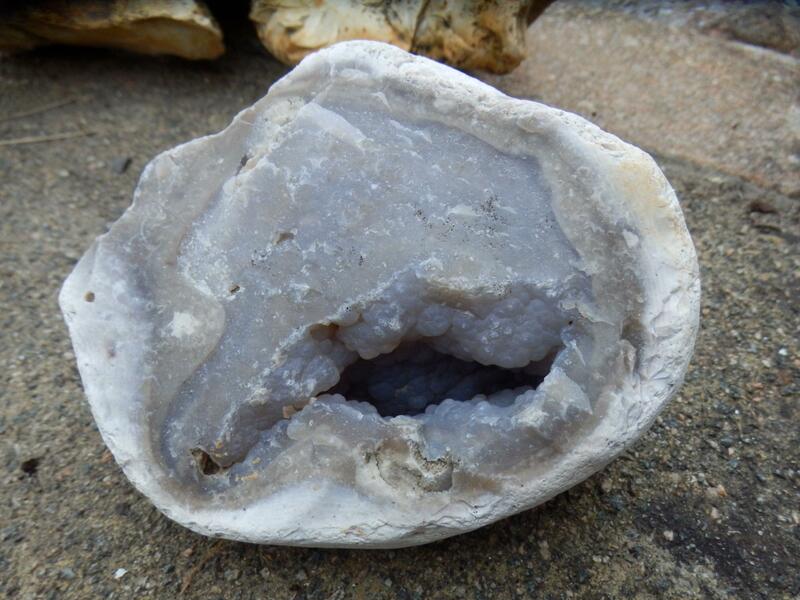 Many of the nodules are obviously secondary having been derived from percolating silica-rich ground water after the calcareous rocks had become indurated and jointed. Alternatively, some may have been primary coagulated precipitates from colloidal silica in sea water which acted as the electrolyte to cause the coagulation (Whitten & Brooks, 1972, p. 94-95). 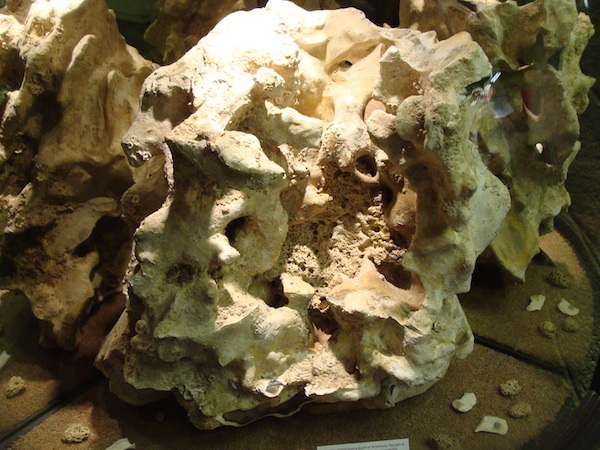 Large flint nodule on display at La Hougue Bie Archaeology and Geology Museum. Allaby, A. & Allaby, M. 1999, A Dictionary of Earth Sciences. Oxford University Press. Bishop, A. C. & Bisson, G. 1989. 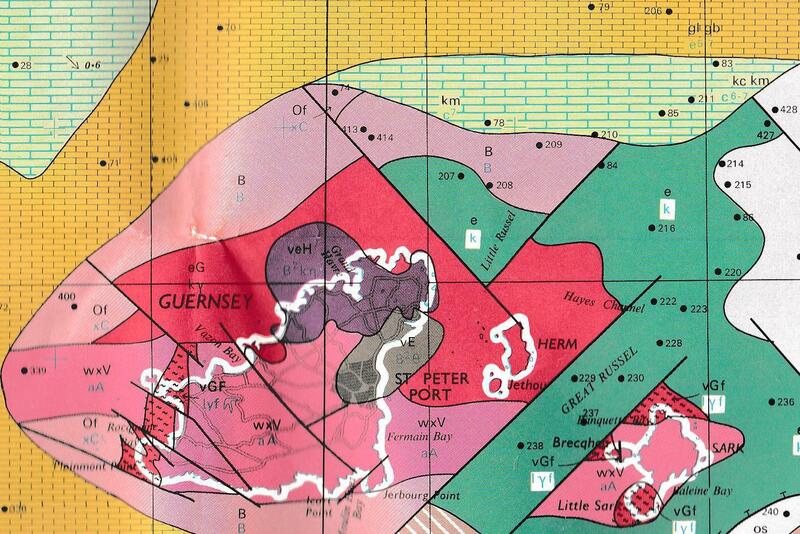 Classical areas of British geology: Jersey: description of 1;25,000 Channel Islands. Sheet 2. (London: HMSO for British Geological Survey). Dunlop, A. 1911. On the Pleistocene beds of Jersey. Bull. Ann. Soc. Jersiaise. Vol. 7. pp. 112 - 120. Keen, D. H. 1975. Two aspects of the last interglacial in Jersey. Ann. Bull. Soc. Jersiaise. Vol. 21. pp. 392 - 396. Keen, D. H. 1978b. The Pleistocene deposits of the Channel Islands. Rep. Inst. Geol. Sci. No. 78/26. Renouf, J. T. 1969. 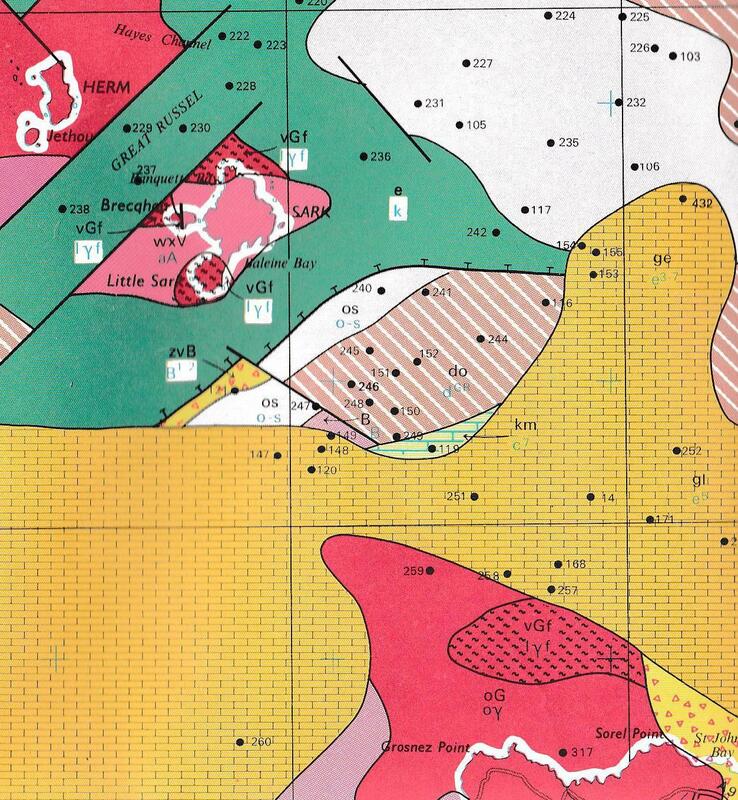 Geological report for 1968. Ann. Bull. Soc. Jers. Vol. 20. pp. 15-16. Renouf, J. T. & Bishop, A. C. 1971. The geology of Fort Regent road tunnel. Ann. Bull. Soc. Jers. Vol. 20. pp. 275 - 283. Whitten, D. G. A. & Brooks, J. R. V. 1972. The Penguin Dictionary of Geology. Penguin Books.